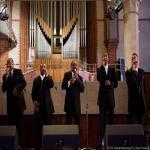 The Northern Kentucky Brotherhood Singers started singing at the 9th Street Baptist Church in Covington, KY. The group has performed in churches, secular music venues and television spots throughout the U.S., as well as in Canada, Russia and Spain (which they have toured 17 times). They have been blessed to enter their 30th year as an A capella group and not only sing Gospel but have recently added Patriotic and feel good R&B's to their repertoire. In 2014 the NKY Brotherhood Singers were honored to do a Live 1 hour long Gospel Concert on CET (PBS) called "Voices of Praise", The National Anthem for The Cincinnati Cyclones Hockey Team 2 Playoff games and are honored to visit Western Kentucky University to sing for "Kentucky Glory: Gospel Music from the Commonwealth". In 2013 the NKY Brotherhood singers produced a Jingle for Former Cincinnati Bengals Football Player Reggie Kelly's Salsa Website (http://www.kyvan82.com) and completed a return performance in Washington, D.C. on August 7 at the Library of Congress and the Kennedy Center. They also sung for the 40th Annual Wheatland Music Festival in Remus, MI and the Richmond Folk Festival in Richmond, Va. In 2012, The NKY Brotherhood Singers completed a successful ten day tour of Russia (St. Petersburg, Kaliningrad, Kirov and Nizhny Novgorod) thanks to the CEC Artslink Organization, Library of Congress and Russian Embassy and sung in a Friendship Concert during the World Choir Games (July 12) and Reds Games (July 15), the Great Lakes Folk Festival in East Lansing, Michigan (August 11-12) and rendered the National Anthem for the Cincinnati Bengals Regular Season Home Opener versus the Cleveland Browns (The Battle of OHIO) on September 16. They've sung at the Kentucky Governor's Mansion, Ottawa's Blues Fest (98-99), numerous appearances on Fox 19, Basketball and MLB Baseball games. If you like foot stomping, hand clapping, tight harmonies that will get your spirit PRAISING God sitting down or standing up then be sure to download this cd for your collection. If you don't like the music then let the message minister to you soul. God Bless. Ric was born and raised in Covington, KY to a family of singers and learned his singing techniques from his parents. After graduating from Holmes H.S. he pursued a career in law enforcement, and spent two years in the U.S. Army Military Police. He returned to civilian life and served 24Ã?Â½ years on various police forces. Music was always in his soul, and he joined the 9th St. Baptist choir and their Brotherhood mens group under the direction of Rev. Robert "Butch" Gillespie and Pastor Richard Fowler. In 1988 he founded the NKY Brotherhood Singers. Ric thanks the Lord for the many prayers from families and friends even when times seem hopeless. He is hopeful for a full and promising future for the Brotherhood, and those to whom they can bring joy. Eric, born and raised in Covington, KY, began his journey in music at a very early age. He realized that God had blessed him vocally, and joined the NKY Brotherhood Singers who have been together for 25 years. With the Brotherhood Singers, Eric was blessed to have been an opening act for artists such as: Ray Charles, The Dixie Hummingbirds, M.C. Hammer, and Ike Turner, just to name a few. They have also toured the European countries of Spain, France, Italy, Switzerland and Portugal. Along with singing in a multitude of weddings, Eric has also made 2 appearances as a background vocalist on the Bobby Jones Gospel Hour on BET. He's enjoyed teaching vocals at the Frank Duvenek Center in Covington occasionally. Stace joined the group in Feb 2007 and is known as "Dot.com" to the group and "Babydeac" to the world. He got this name by being ordained the youngest Deacon at the New Jerusalem Baptist Church in 1999. He and his beautiful wife have 7 children. They are members of the Solid Rock Church in Monroe and Amelia, Ohio where he has ministers on the Praise Team with the Choir and as a soloist during church service. Stace also performs with the Duke Energy Choir and his biggest Harmonic influences were the Mighty Harptones of Cincinnati and Take 6. Stace gives GOD ALL THE GLORY and lives by Phillipians 4:13. "Chilly Wind" started singing at the tender age of seven in front of the entire douglas elementary school. He was told then he had singing capabilities and to refine his gift. Under the guidance of the late William Godfrey and David Godfrey he was taught singing techniques to effectively sing all parts in the A capella structure. Ex-marine of 7 years. His Music hero's are the late Vincent Godfrey, Sam Cooke and Donnie Hathaway. He strive's to carryout God's message of pure love through song. Our Newest member, affectionately known as "Watson", was born and raised in Cincinnati, OH. He's sung in several vocal groups over the years as a natural Baritone/Bass and truly remains strong in sharing the love of the Lord through song. Jesus is the reason he does what he does (Lifting up the Name of Jesus through song) so passionately and he loves singing with a group of Brothers that live the life that they sing about. He's a retiree from the University of cincinnati Hospital (29 years), has a son name Tristan and unfortunately is a widow. He loves cooking, eating, enjoys music of all kinds but most of all loves serving the LORD the most.